My new book, Guide to CFO Success: Leadership Strategies for Corporate Financial Professionals, was released in the United States and Canada in March. Thanks to my publisher, John Wiley & Sons, I am able to provide you with the complete first chapter of the book. 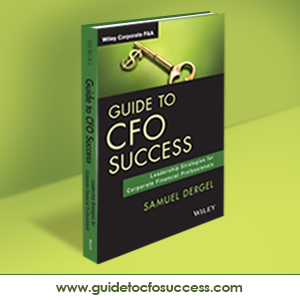 Guide to CFO Success was written for the Chief Financial Officer, people on the path to CFO, as well as people who work with the Chief Financial Officer. This book helps current and aspiring CFOs develop the leadership strategies they need to positively impact their careers and deliver consistently exceptional results to their employing organizations. To preview more of the book, just follow this link to Amazon.com. Please note you can purchase Guide to CFO Success wherever books and e-books are sold. To find out where you can buy the book, follow this link. In today’s world of Search Engine Optimization (SEO), the power of Google can lead this book to be recommended to those who can get the best value from it. Thank you for your involvement in making a difference to others.